Vacuums R Us is pleased to offer lamp repair services. 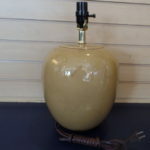 We would love to get your cherished or unique lamp working and electrically safe again. $15 off any one lamp repair bill! * Restrictions apply see vacuumsrus.com for details. Your information will be used to send a single email or text with your coupon. No further marketing contacts will be made with the information provided unless you request otherwise. We do not share our customer’s information with any other companies. * $15 off may only be used once per customer and can only be applied to a single lamp repair.